Perhaps the most grippy mountain bike shoe ever. Before the Freeriders, I used to ride in Vans. They were comfy and felt great off the bike. They gripped well enough and I liked them. 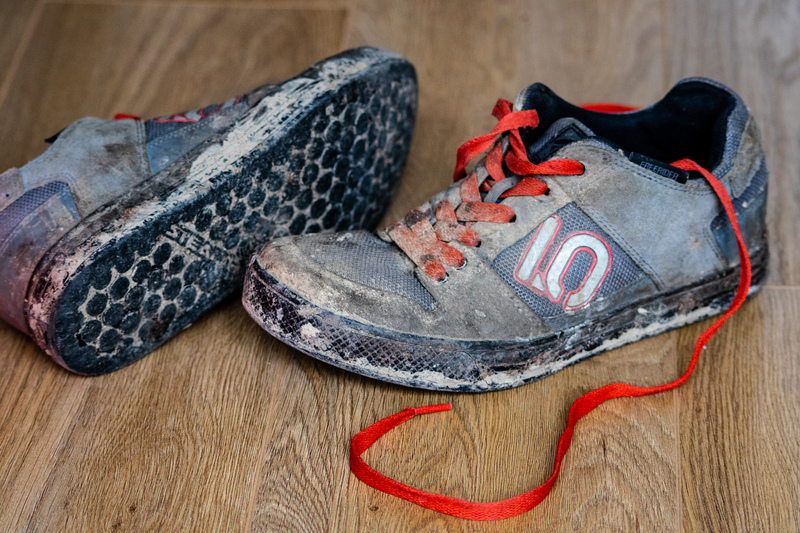 The only reason I grabbed a pair of Five Tens was because they were on offer and I didn’t want to keep getting my Vans filthy when I wanted to wear them out and about off the bike the day after. I’m pleased I did because the Vans are strictly for off-bike usage now (or BMX). The Freeriders are almost skate style in fit. They’ve got plenty of padding and rise to almost ankle height. The tongue is thick and the sole is well cushioned. Five Ten have produced a quality product that remind me of footwear I used to wear as a teen when I dreamt of being the next Tony Hawk. Though the most noticeable difference between skate shoes and the Freeriders is the sole – it’s much stiffer than a pair of regular shoes. At first, this feels strange when walking around, as though there’s not enough feeling between you and the floor. This translates perfectly to a planted footing on the bike, though. The stiff sole means the pedal sits comfortably underneath the foot and doesn’t cause any pain during longer rides, where the Vans lose out as the sole flexes. 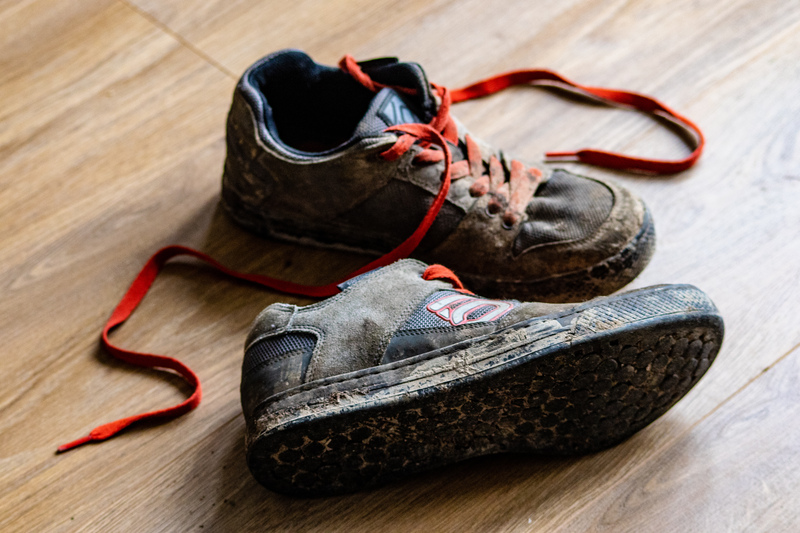 The tip of the shoe, where your toes are, doesn’t feel extra stiff (there’s certainly no toe-cap) but from experience seems to offer some protection when rocks have tried to see which little piggy of mine wants to go to market. When I have smashed my feet into rocks, generally they’ve come out very well and I put that down to the robustness of the Freeriders. The grip of Five Tens comes from their ‘Stealth’ rubber. When new, I struggled to walk across the laminate flooring in my living room as they were so sticky. Eventually, this tacky feel seems to ease off a little and I began slipping pedals from time to time. I soon found it wasn’t time for new shoes though: it was just time to throw the Freeriders into the washing machine. After a clean they came out as sticky as new… and smelling of lavender. As far as gripes go, I’ve only got little ones. The only problem I’ve encountered with the actual shoe is that it’s a real pain to dry after it gets wet. 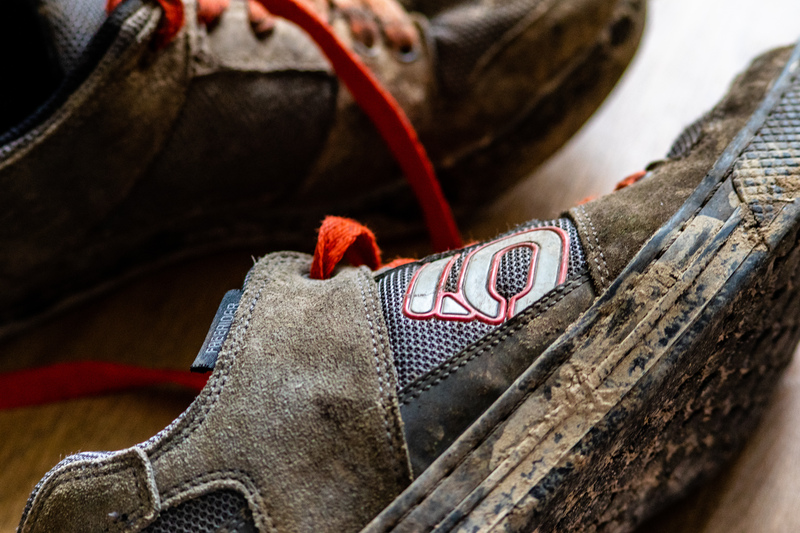 I think it’s mostly down to the cushioning of the shoe – which seems to act like a sponge when wet. On some really rainy days, or when rides have taken us through river crossings, the Freeriders have become little fishbowls for my feet. The only answer I’ve found to this is to get a decent pair of waterproof socks. Not a massive problem. The laces they shipped with are enormous and I have to push them into the shoe once tied to stop them getting tangled in the bike. Again, such a tiny problem it’s hardly worth mentioning. After using these shoes for around three years or so, I’m incredibly impressed with how well they’ve dealt with a beating. They’ve stood up to DMR vaults and their ridiculous pins (and even the Terror Pins I later added) and are only just showing signs of wear now. 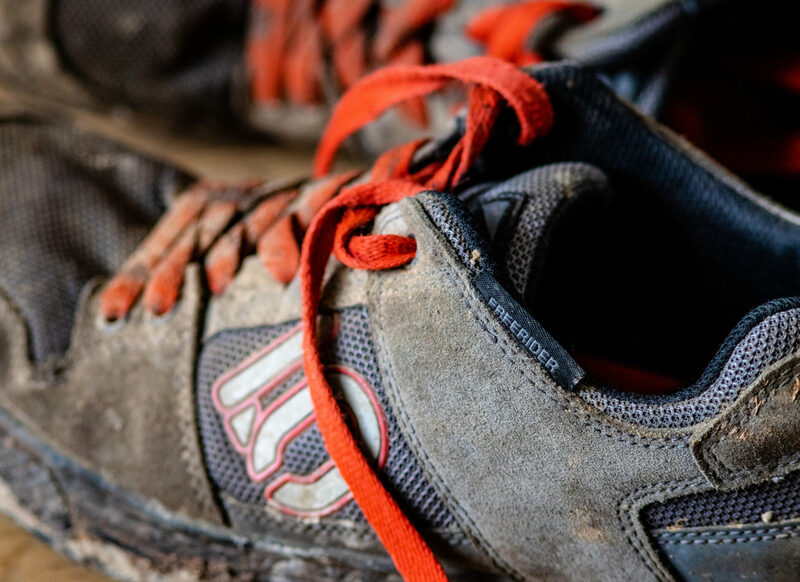 The thing you’ll find most useful to know – would I use any other brand of footwear now I’ve used these? The answer is no. Hardwearing, comfy and they really do grip like nothing else! The only downside – they’re a pain to dry out.